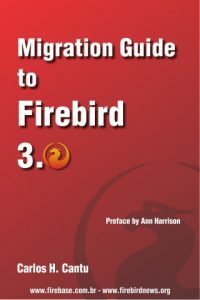 The new version of FirebirdDbComparer is published and this version contains among small bug fixes and performance optimizations also one big new feature and that’s support for packages in Firebird 3. Thank you to the creators and maintainers of the @FirebirdSQL database. After 19 years, my shop has transitioned to @PostgreSQL, but I will always have a soft spot in my heart for Firebird. Related: https://t.co/8mnOsg0tIg and https://t.co/GJx6gai3wU will need new maintainers. The LibreOffice Quality Assurance ( QA ) Team is happy to announce LibreOffice 6.2 Beta1 is ready for testing! Meiji Kimura and Hajime Nakagami created Firebird Advent Calendar 2018 , there Firebird Japanese community will post articles in each day of Advent period (Anyone can participate even with English articles). You can check for articles from the previous year for inspiration. 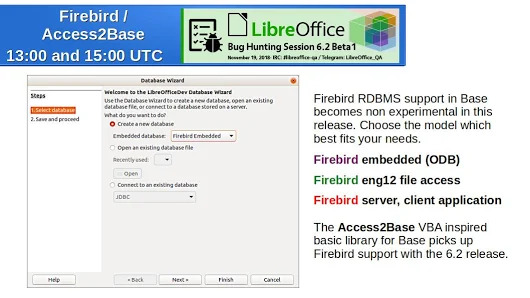 Added dedicated session from 13:00 to 15:00 UTC for Base support of Firebird embedded engine and Access2Base basic library Firebird 3 support.